In 1888 Trotter went to Algeria as a missionary, where she worked until her death, publishing Arabic translations of the gospels and organizing conferences for the missionaries of north Africa. At the same time she responded passionately both as an artist and as an evangelical to the landscape and colours of Algeria. Fascinated by the vivid sapphire blue of Kabylian berries growing deep under matted grass, she tried to paint them ‘to show what God can do with the very feeblest ray; but the blue is an unattainable colour’ (Master of the Impossible, 19). 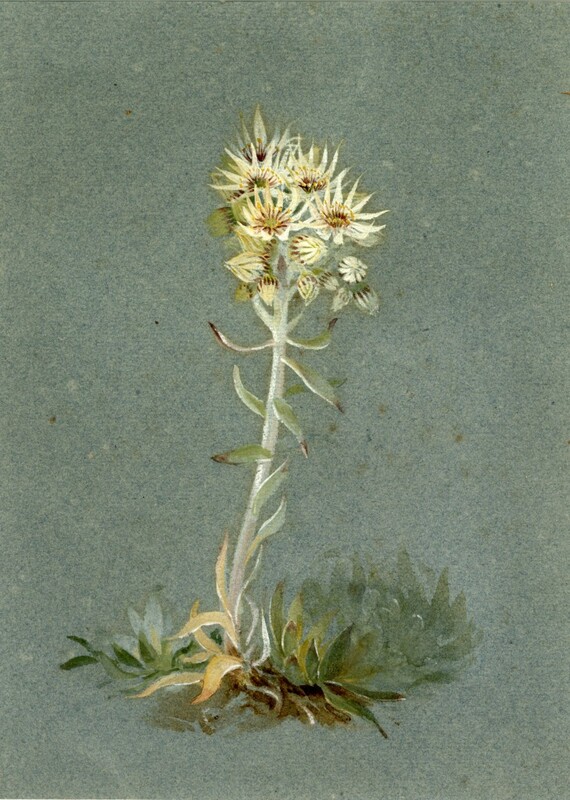 In 1926 she published a little story, Focussed, written for the YWCA, in which she used a similar image of a dandelion, catching a shaft of sun in a dark wood: from this she developed the metaphor of the lens to press the need for everyone to choose on what to focus and not to dissipate energy. Her aesthetic comments on detail and line, in Africa and on trips in Switzerland and north Italy, continued to show a strong Ruskinian sensibility. Until her death she sent watercolours of people, places, and plants—often in a bold and independent style—to him among others. She died in Algiers on 27 August 1928. The Armstrong Browning Library owns one letter from John Ruskin to Lilias Trotter. Letter from John Ruskin to Lilias Trotter. 15 August 1879. 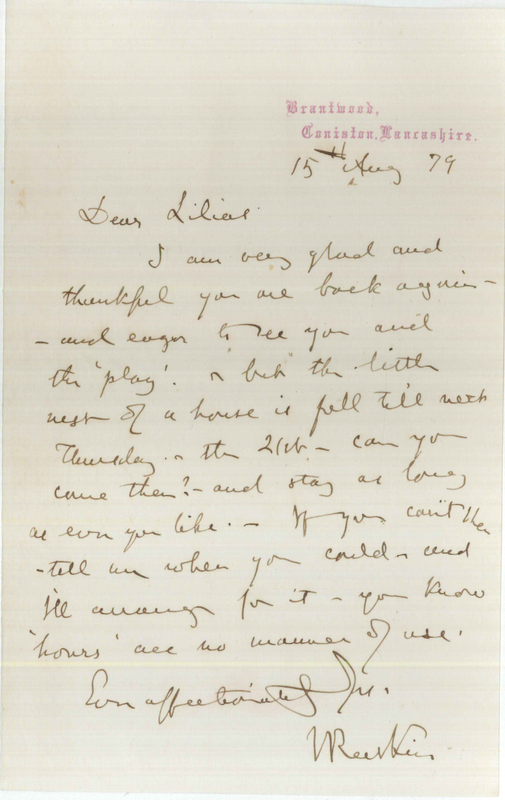 In this letter, Ruskin invites Lilias to come to Brantwood on Thursday, the 21st. I am very glad and thankful you are back again—and eager to see you and the ‘play’.—but the little nest of a house is full till next Thursday—the 21st—can you come then?—and stay as long as ever you like.—If you can’t then tell me when you could—and I’ll arrange for it—you know ‘hours’ are no manner of use. John Ruskin. 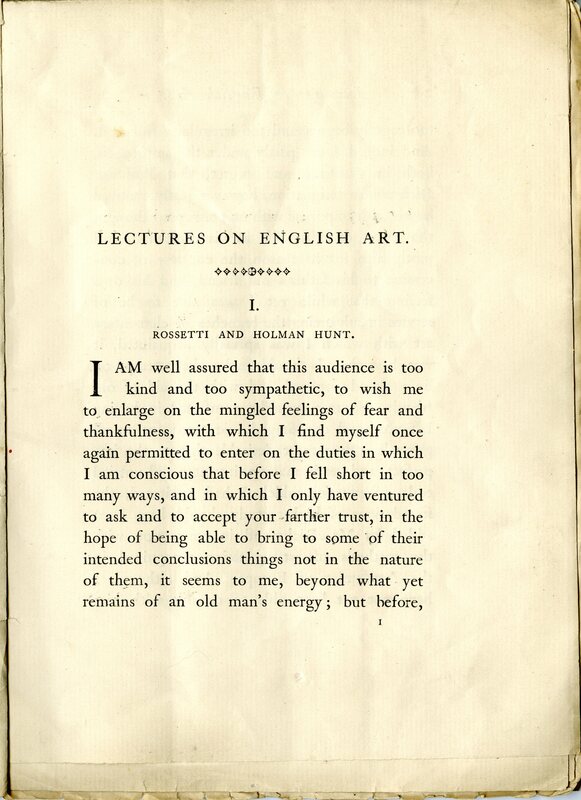 Inscription on cover page of proof pages of Lectures on English Art. John Ruskin. 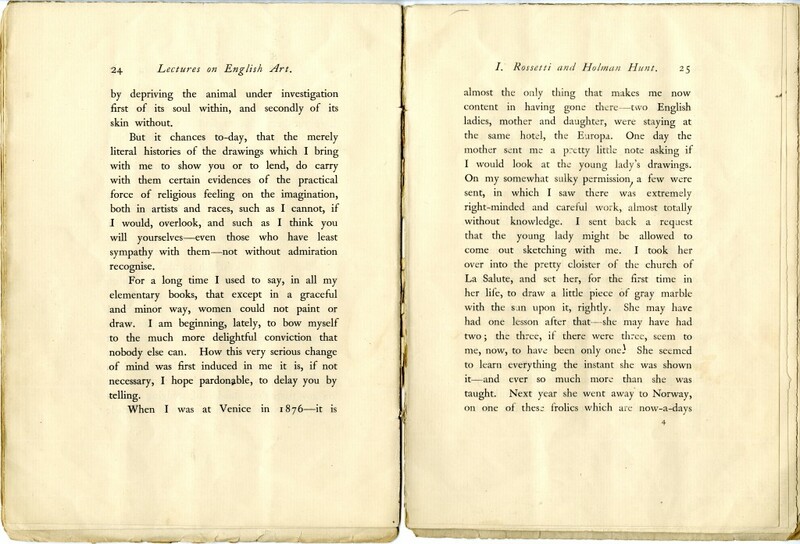 proof pages of Lectures on English Art. John Ruskin. Proof pages for Lectures on English Art. Pages 24 and 25. When I was at Venice in 1876—it is almost the only thing that makes me now content in having gone there,—two English ladies, mother and daughter, were staying at the same hotel, the Europa. One day the mother sent me a pretty little note asking if I would look at the young lady’s drawings. On my some what sulky permission, a few were sent, in which I saw there was extremely right-minded and careful work, almost totally without knowledge. I sent back a request that the young lady might be allowed to come out sketching with me. I took her over into the pretty cloister of the church of La Salute, and set her, for the first time in her life, to draw a little piece of gay marble with the sun upon it, rightly. She may have had one lesson after that—she may have had two : the three, if there were three, seem to me, now to have been only one ! She seemed to learn everything the instant she was shown it—and ever so much more than she was taught. 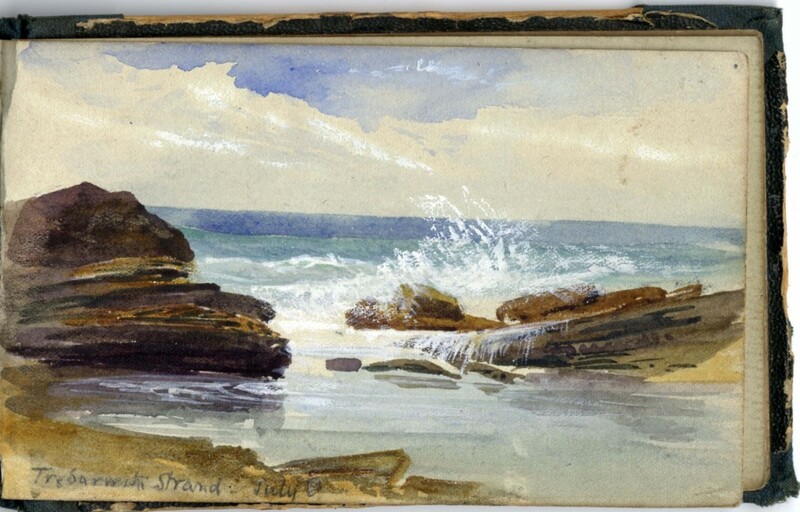 The Ruskin Museum has made available to the Armstrong Browning Library several drawings and paintings by Lilias Trotter. 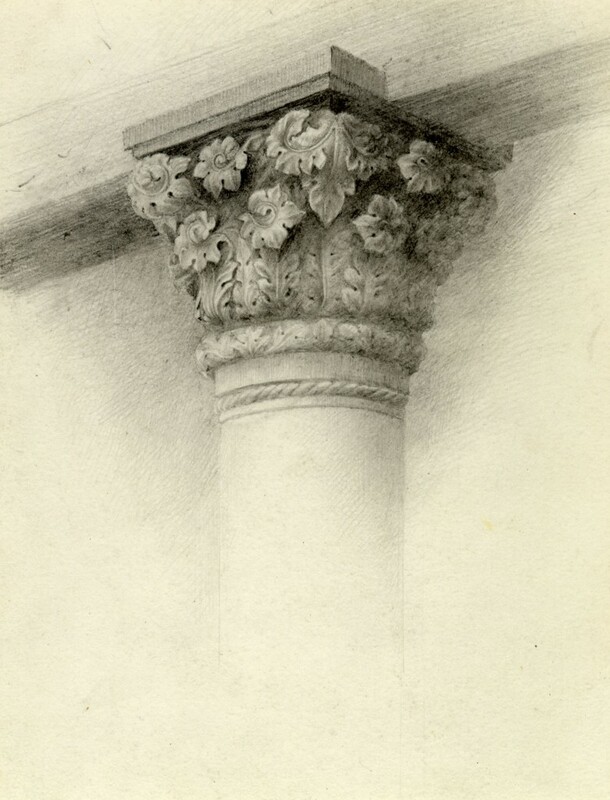 Among the images is a drawing of a capital of a column. 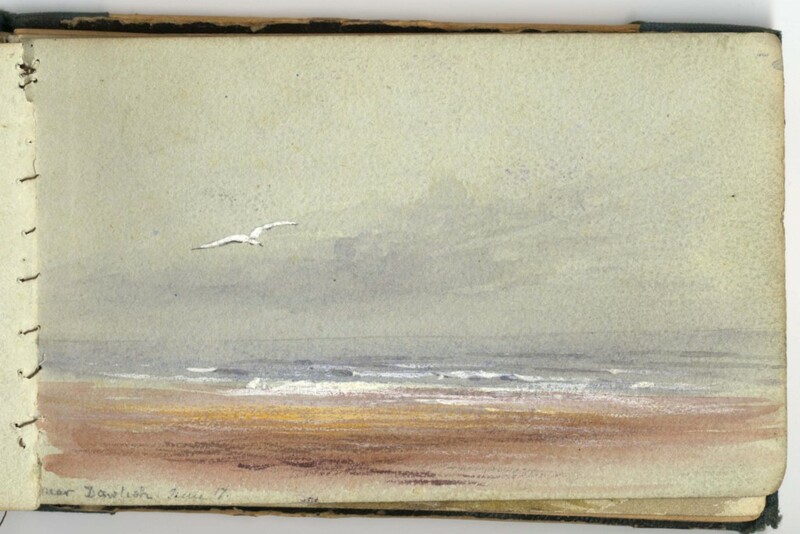 Perhaps this is the sketch to which Ruskin referred in his lecture. Lilias Trotter. Column. Courtesy of Ruskin Library. 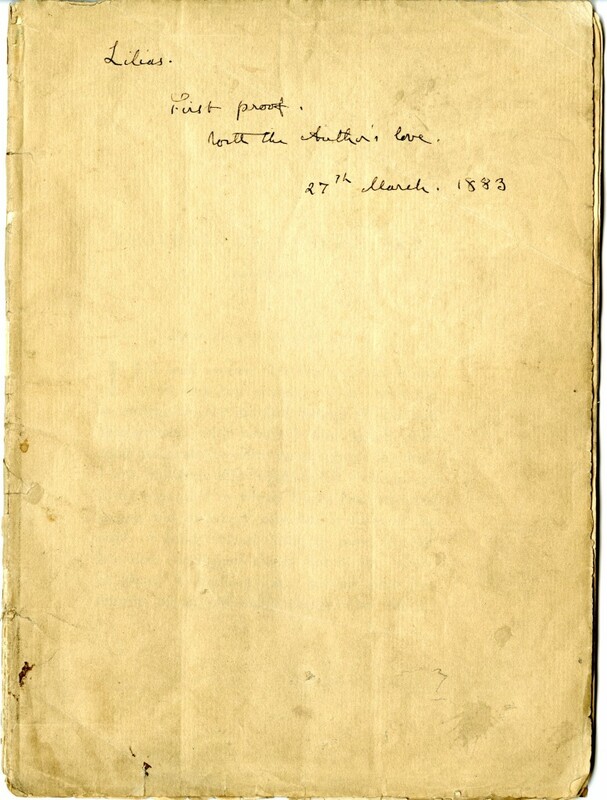 The Armstrong Browning Library also owns a page on which is mounted Ruskin’s handwritten notes from “Stones” in Modern Painters, Volume 6 (Chapter 18, Page 817). At the bottom of the page are sketches of Stonehenge, a stone frieze, and the Toad Rock. John Ruskin. Drawings from Stones of Venice. Those drawings from the Norwegian sketchbook are now located at the Ashmolean Museum at the University of Oxford. The sketches measures 2 in. X 4 in. 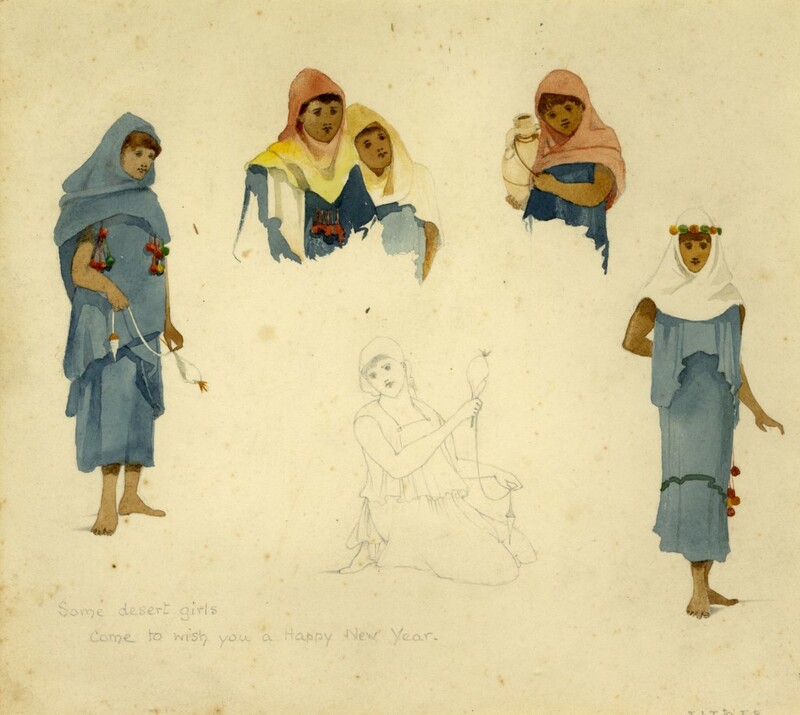 A facsimile of Lilias Trotter’s 1876 Sketchbook: Scenes from Lucerne to Venice and Lilias Trotter’s 1889 Sketchbook: Scenes From North Africa, Italy & Switzerland are available for purchase. 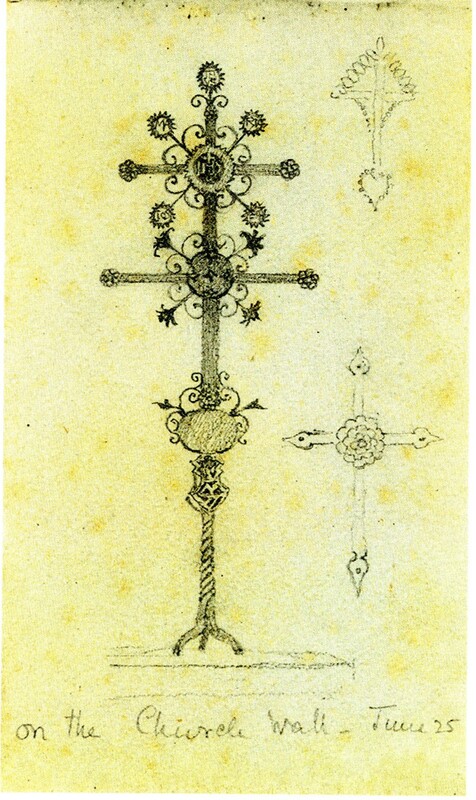 This illustration from her 1889 sketchbook of an ironwork cross illustrates the “pocket-book work” Ruskin described. Lilias Trotter. 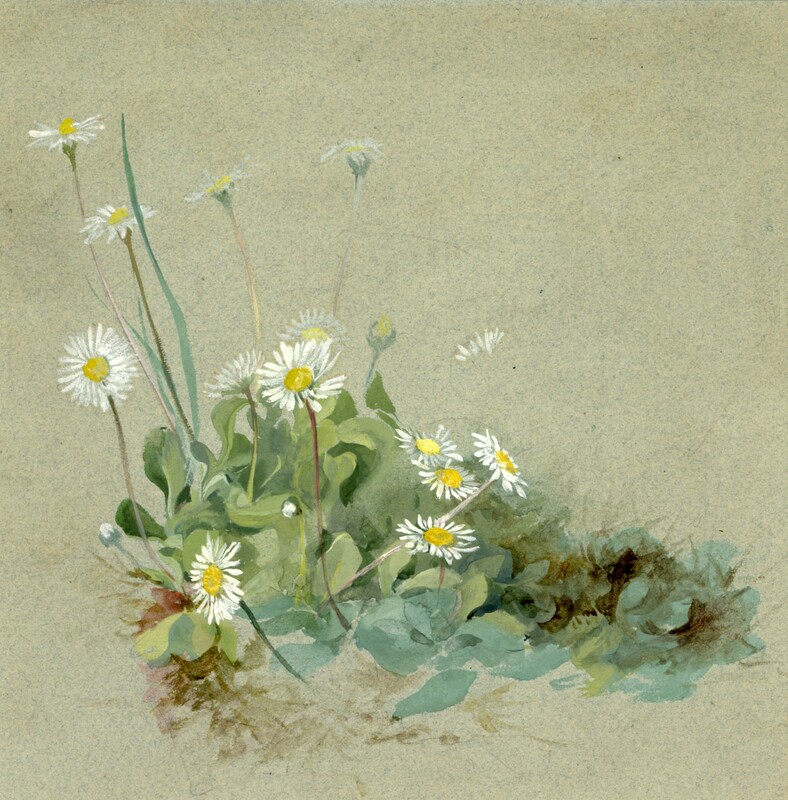 “Cross” from Lilias Trotter’s Sketchbook of 1889. 2 in. X 4 in. Lilias Trotter. Figure Studies. Courtesy of Ruskin Library. Lilias Trotter. Mountain Range and Desert. Courtesy of Ruskin Library. Lilias Trotter. Image from Sketchbook-3. Courtesy of Ruskin Library. Lilias Trotter. Image from Sketchbook-15. Courtesty of Ruskin Library. Lilias Trotter. Daisies. Courtesy of Ruskin Library. Lilias Trotter. Desert Flowers. Courtesy of Ruskin Library. This entry was posted in Seeing Many Beautiful Things and tagged Brantwood, John Ruskin, Lilias Trotter, Seeing Many Beautiful Things, Stones of Venice, Venice by melindacreech. Bookmark the permalink.